I’m one of those people who gets very excited about ideas. One weekend on a Saturday Jacob and I were running errands and I decided it was the day I was going to make my first steamed fish. I was very excited with the notion of a new kitchen tool–a steamer! I love fish–it’s very healthy, tastes wonderful, and is ultra satisfying on a breezy summers day. I rarely shop at Williams-Sonoma (of course most people go in there only to order things off their phone) but I was delightfully surprised to find a great deal on a steamer. For only $20 bucks we took home a beautiful simple wood steamer. If you live in the Bay Area and you have access to fresh fish, I encourage you to get it from some place like Berkeley bowl, although it’s a little pricier, it’s well worth it. I’m all about intuitive cooking–using your best judgement to put small variations on your favorite recipes–and for this one I didn’t have two kinds of Japanese wine, I just used the one sake we had in the house. The recipe came out fine! I don’t generally cook cod, but I had heard of its mild flavor and dense, flaky white meat--it’s used to make cod liver oil, an important source of vitamin A, vitamin D, vitamin E and omega-3 fatty acids (EPA and DHA). I got this wonderful heart-healthy cod recipe from Cooking Light Magazine. steamed baby bok choy and a side of chutney. 1. Set a steamer in a wok or pot with 2 in. water underneath. Bring water to boil. 2. Boil sake and mirin until reduced by half. Mince 1 tbsp. lemongrass; cut the rest into thin 3-instrips. Add minced lemongrass to sake mixture, reduce heat to medium and add onion, garlic, juices, and zest. Cook 3 minutes; add chili sauce and cook until thickened, 10 minutes. 3. Put lemongrass strips and ginger in steamer. 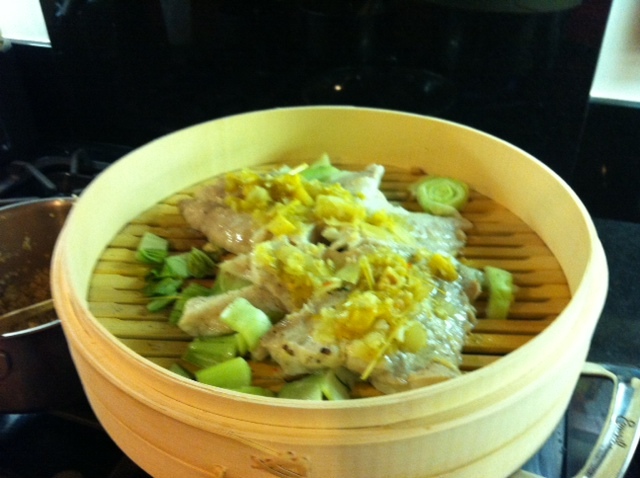 Top with fish; cook, covered until just opaque in center, 8 minutes. serve over rice with a drizzle of sauce and the cilantro. The perfect summer dinner party entree, leaving you feeling satisfied, light and happy. 242 calories, 22 g protein, 2.3 g fat, 18 g carbs, 190 mg sodium, 40 mg chol. I’ve never steamed fish before, but you’ve inspired me. We’re eating a lot more fish these days, because there’s so much good stuff here. I’ll have to bookmark this recipe and give it a try. Laura, what a delight to see you at the Blakery :-] There is a ton of great fish around here, and steaming is fairly easy-no fuss. 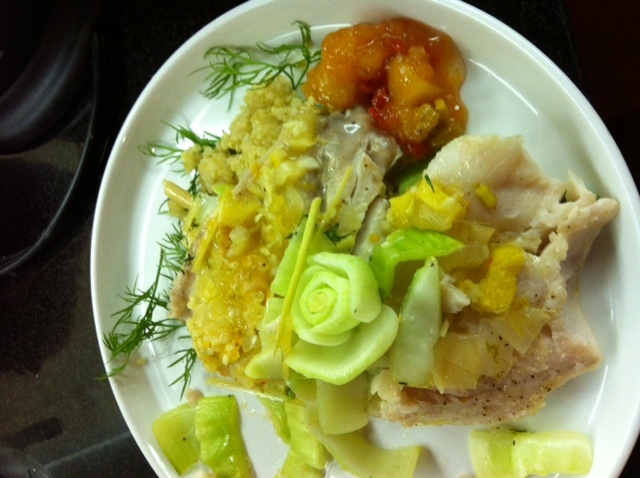 I also made moonfish recently which was awesome (found at Berkeley bowl). Yum! !